Welcome back to the TCC News Special Edition, where periodically we address a specific topic in depth. 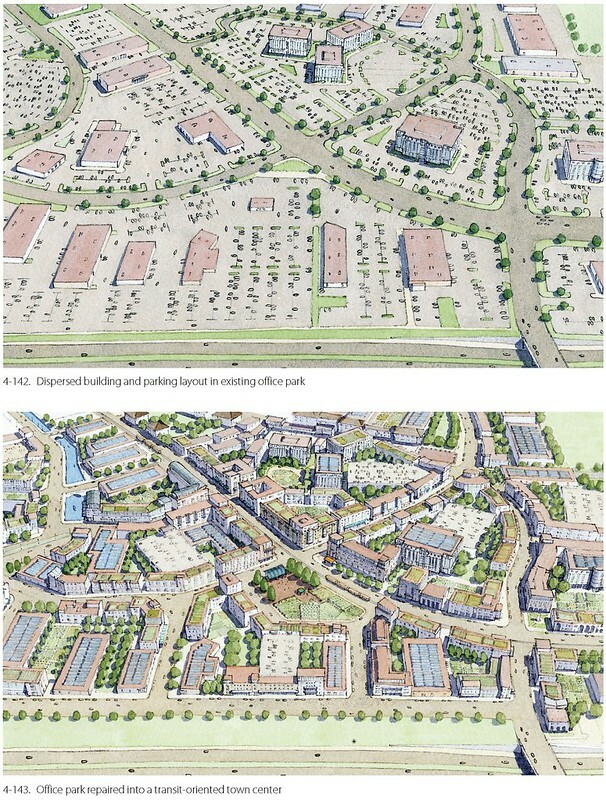 In this edition Galina Tachieva, author of the Sprawl Repair Manual and Sprawl Repair SmartCode Module, contemplates the Transect as a tool for repairing low-density, autocentric environments by adding gradients of complexity and organic character based on the rural-to-urban continuum of the Transect. Human settlements are resilient and successional in nature. They change, going through cycles of regression, deterioration and advancement. Even the most cosmopolitan cities started as meager hamlets on crossroads, but then grew and matured, while regenerating their physical environment multiple times throughout their histories. Today's image of American urbanism is inseparable from the image of sprawl: endless, soulless, wasteful, but most importantly, malfunctioning. This predicament may signal a pivotal point, as has happened in previous civilizations, when quantitative and qualitative changes converge and the paradigm shifts towards better human habitats. Sprawl is failing. It has underperformed for a long time, but its collapse became obvious with the 2008-2010 financial meltdown that magnified the problems of its failure. Building more sprawl cannot continue for a lack of capital and the failure of the financial instruments that enabled its proliferation. To abandon existing sprawl will not be possible either, as the expanse represents a vast investment of money, infrastructure, time, human energy, and dreams. Our existing physical environment offers opportunities for reuse, and cannot be simply discarded or demolished. The only reasonable option is to repair sprawl----to deal with it straight on, by finding ways to reuse and reorganize as much of it as possible into complete, livable, robust communities. Pragmatism calls for repair through redevelopment into viable human-scale settlements----places that are walkable, with mixes of uses and transportation options. Realistically, portions of sprawl are likely to remain in their current state, while others may devolve, reverting to agriculture or nature. There are several examples from urban history that show successful transformations of existing rural patterns "on the edges" into more urban and resilient environments. Camillo Sitte's work in the late 19th century demonstrates the redevelopment of rural hamlets into the next sequence of urbanism, denser urban villages. Sensitive treatment kept most trajectories of existing rural roads, maintaining traces of the land and wisdom of the first settlers. He also respected most of the property lines by subdividing the plots parallel to these lines. The result was complex and picturesque urbanism in contrast to the Beaux-Arts grand gestures prevalent at that time that cut bold diagonals and formal public spaces through the existing fabric to achieve direct terminations and symmetry. Other examples of generational transformation of human settlements are the "bulwarks," or fortification walls, around many European cities. When these defense installations became obsolete they were often redeveloped into grand perimeter boulevards, such as the Ringstrasse in Vienna pictured below, to be used not only for circulation but also as eminent public spaces accommodating civic buildings and parks. These examples are among many others that can give us confidence that any human-built artifact, including sprawl, can be redeemed through reuse and restructuring. The past six decades in American planning have achieved a dramatic transformation from compact and walkable environments into car-oriented, single-use sprawling patterns. We are starting to see a transitioning back to walkable, diverse and human-scale communities. How to achieve sprawl repair? Sprawl has been aggressively promoted and encouraged, and the approach to repair must be the same. The operational and maintenance costs for existing sprawl are rising, straining stretched government finances. New development that pays for these costs is difficult because capital is scarce, credit is expensive, and energy costs are growing. Sprawl repair is possible via comprehensive urban design, regulation, and strategies for funding and incentives----the same instruments that made sprawl the prevalent form of development. Effective repair addresses all urban scales----region, community, building----identifying potential transportation networks and creating transit-connected urban cores, transforming dead malls into town centers, and reconfiguring conventional suburban blocks into walkable fabric. Rather than the instant and total overhaul of communities, as promoted so destructively in American cities half a century ago, incremental and opportunistic improvement is key. Sprawl must be fixed. The good news is that we have the tools to do it. The Transect is one such tool. Even though sprawl's poor performance has been proven, it is still difficult to approve and finance mixed-use, walkable, and diverse projects. A total overhaul of current zoning practices is required for an effective intervention in suburbia. New codes are being adopted one municipality at a time, as overlay districts, in parallel, or in place of existing codes. In all cases, these codes must powerfully incentivize smart growth rather than sprawl. Form-based codes regulate the form of the built environment, encouraging place-making. The SmartCode is a comprehensive framework that must be customized for local conditions to enable smart growth community patterns and the transformation of sprawl into walkable urbanism. The SmartCode's Sprawl Repair Sector G-5 is being used in several places to assist currently single-use, disconnected development patterns to redevelop into neighborhoods and urban centers. 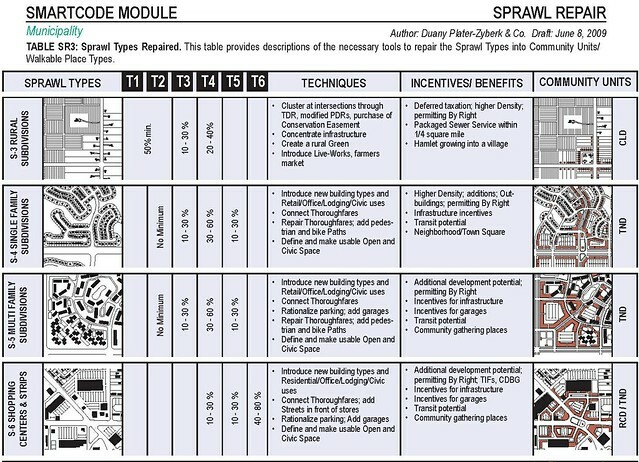 The Sprawl Repair Module presents a sequence of techniques for retrofitting the sprawl elements into complete communities at the scale of the region, community, block, building, and thoroughfare. Some sprawl areas may be up-zoned to accommodate higher but well-designed density, and allow the introduction of mixed uses and transit. This regulatory basis for successional growth into viable neighborhoods increases transportation and housing choice. At the scale of the building, important issues include flexible uses within existing structures (houses becoming live-work units, big-box retail becoming office space or civic buildings), and increased density within existing parcels and lots (a mansion turned into multifamily housing or an assisted living facility, or the addition of accessory units). Another important task is to create standards to calm and repair dangerous thoroughfares and make them safe for walking and cycling while creating connections between residential areas, shops, workplaces, schools, civic buildings, and recreation. The SmartCode and the Sprawl Repair Module operate according to the Rural-to-Urban Transect, an organizational planning methodology. The lack of rural-to-urban logic in sprawl is one of the fundamental differences from traditional urbanism. The Transect is broken into character zones, each representing a complex habitat of different building types, streetscapes and public spaces. Sprawl elements cannot be repaired in isolation; they must always be considered in the context of the community scale. 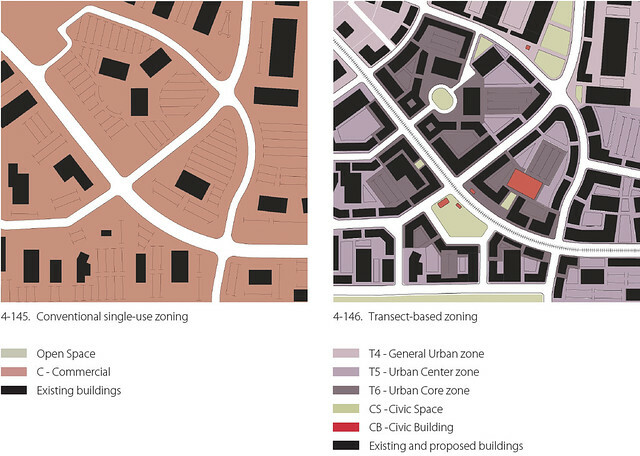 Single-use and typologically monotonous areas need to be balanced with other uses to form the full range of Transect Zones appropriate to complete communities. The Sprawl Repair Module indicates the proportions of Transect Zones that need to be added or rebalanced to transform the sprawl repair target into a mixed-use, diverse and transit-ready community. 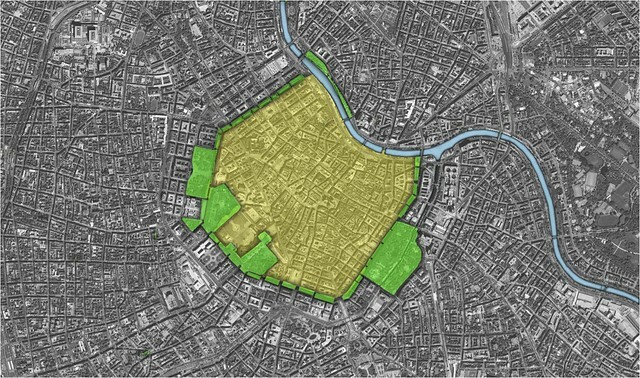 The zoning modifications, together with the urban design adjustments (connecting streets and creating public space) are reflected in specific regulating plans. 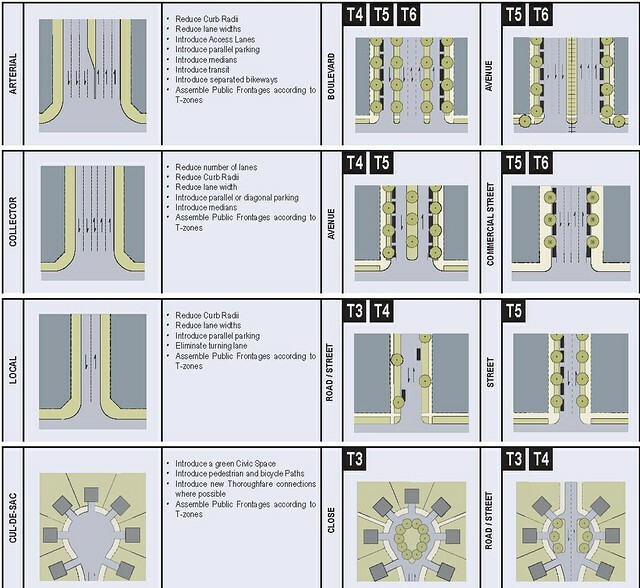 The use of the Transect is essential for sprawl repair because it provides the framework for re-balancing and diversifying the mono-cultural environment of single-use zoning. Use of the Transect provides variety not only in the practical sense of additional uses and building types, but also in other parts of the physical environment through a variety of setbacks, a range of frontage conditions, building heights, etc. Through deliberate design, Transect-based zoning produces places of distinct character, creates landmarks, and delineates recognizable streets and public spaces. Sprawl may be aesthetically pleasing, even elegant, especially in the third-generation, well-manicured and well-managed incarnations of gated communities. However, it obliterates the diversity----or even messiness----that is intrinsic to real urbanism. By introducing the Transect, we can incorporate the existing sprawl elements, but embed them in a wider palette of urban fabric, experiences, geometries, and relationships between man-made and natural entities. 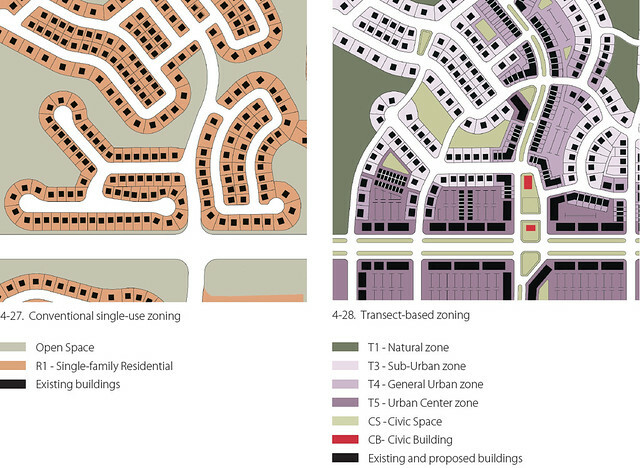 The new system of zoning provides gradients of complexity and organic character based on a rural-to-urban continuum. That complexity and organic character, by the way, can also be very useful in adapting to changing economic conditions. Transect-based zoning provides flexibility by exchanging larger, inflexible parcels and building types with smaller and more affordable varieties whenever the need arises. The wider choices accommodate different people, incomes, and ages, and helps a community get ready for the future. The Transect Codes Council (TCC) is an advisory board to the Center for Applied Transect Studies (CATS). The mission of the TCC is to support CATS in the expansion of the use of its open source Transect-based codes and modules, for planning and regulating the built environment as part of the natural environment. The TCC consists of 18 members, and hosts annual TCC Retreats for advanced practitioners and users of Transect-based codes, such as the SmartCode.